Fundraiser by AnnPhie Oh : BubaBags for Everyone! Buba is 19 years old and comes from Gambia, a small country in western Africa. He has two younger brothers and a sister. His father passed away, while he was still a child. 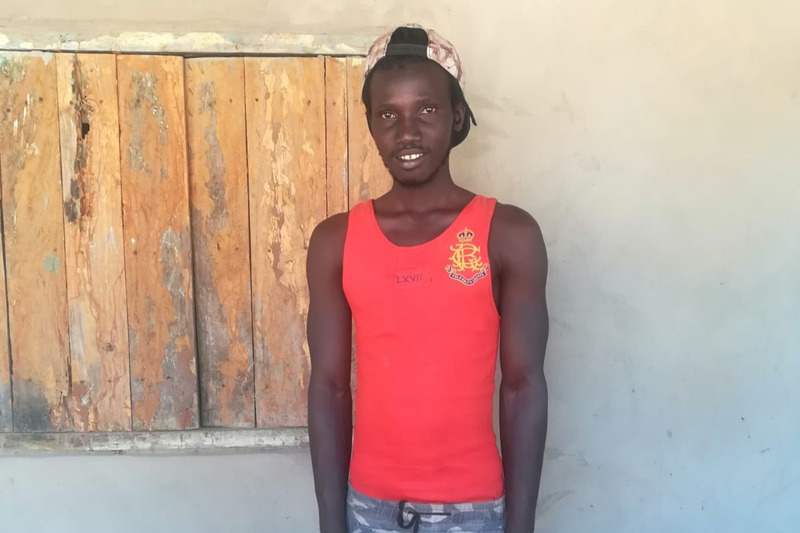 He had started training as a tailor and took part in school theatre plays, but due to extreme poverty and bad conditions, Buba fled Gambia at the age of 15. Shortly after, his mother and siblings crossed the border to Senegal. He spent a year in Lybia and finally came to Vienna, Austria at the age of sixteen and a half. As an "unaccompanied minor" he attended Youth College where he received German lessons and a general education, whilst applying for Asylum in Austria. We met Buba in 2017 at Peacecamp. 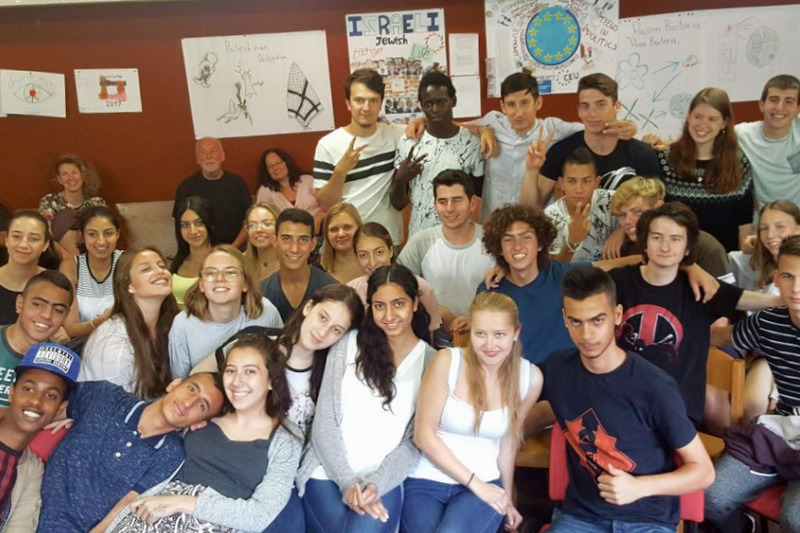 Peacecamp takes place every July in a small tranquil town in the Austrian alps, and brings together youth from conflicting areas - Jews and Palestinians, Austrians, Hungarians and also, refugees. We can define the experience there as no less than extraordinary. Despite disagreements we learned to understand each other and through discussions, theatre, and just hanging out together, we all became one big family. Buba is part of our family. He is a compassionate, funny, good hearted soul. At the improvised talent show on the first evening of Peacecamp 2017, Buba and Musti dropped this dance. He is also a very enthusiastic runner, football player and quite the actor. When he saw the kind of colourful pants the camp coordinators wore, he told the camp founder, Evelyn: "You know, I can make these." Evelyn organized an old second hand sewing machine and in the year following peace camp, Buba worked with donated materials and this stubborn old sewing machine to create beautiful bags. 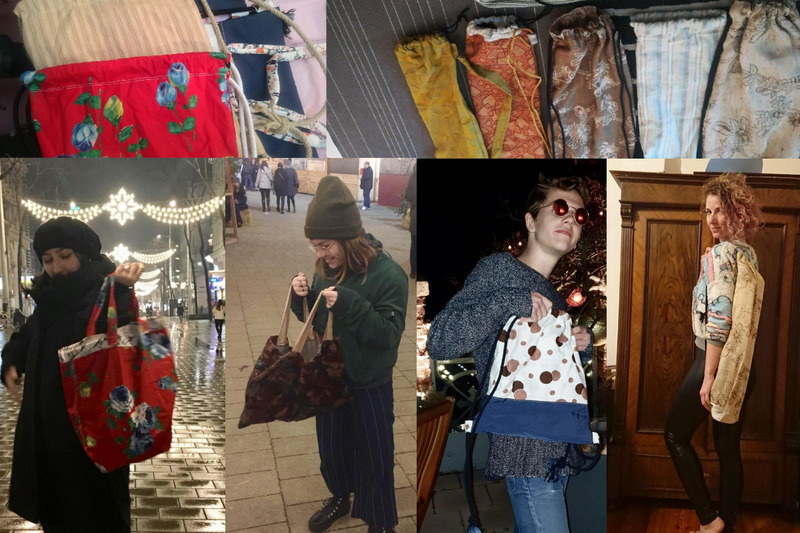 The bags were made from recycled fabric, such as old trousers and curtains. 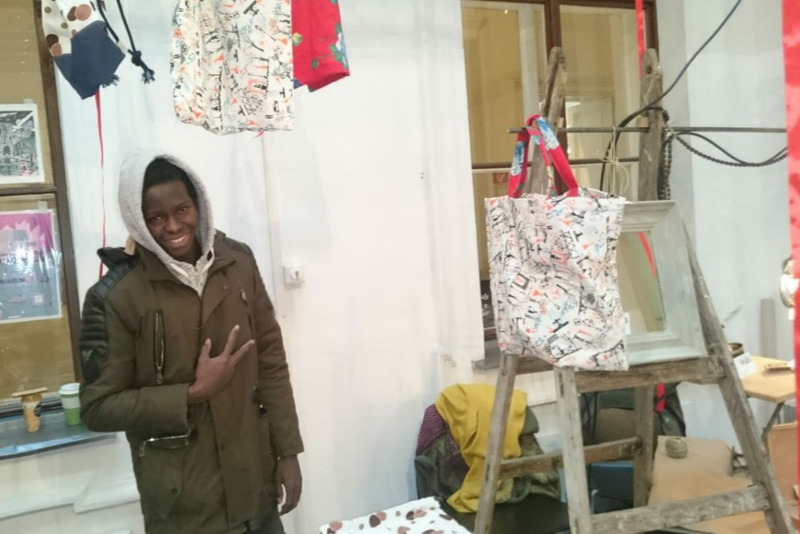 Buba´s bags were sold at small charity events and Christmas markets. Unlike many other hip, fashionable bags, they are robust and hold for a long time. That is because they are all carefully crafted and hand-made. You can easily take them shopping, jogging or dancing. 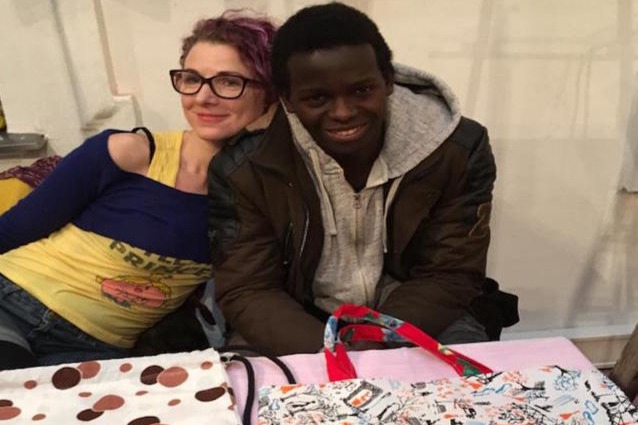 AnnPhie and Buba at the christmas market of Vienna´s University for Applied Arts, 2017. This year´s stand had to be withdrawn, because Buba had already been deported. When Buba turned 18, he was no longer a minor and the Austrian government does not see poverty as a reason for Asylum. None of the appeals, nor letters of recommendation were successful. Buba did not dare tell his mother, that he would be sent back. He was very afraid to go, but we tried to give him hope. Despite feeling he had failed to build a life in Europe, and was going back home “empty handed”, we let him know he had friends in Austria, Hungary and Israel. Buba now lives in a small village named Kembujeh with his mother who has come back from Senegal to live with him. They both want his siblings to come back and live with them, but their house is too small, and has a leaking roof. They’d like to renovate their house but are dealing with a rent of about 200 Euros a month which they can hardly afford. Much work needs to be done and Buba wants to take it upon himself to support the whole family, which is currently still living as refugees in Senegal. Together with a friend they want to start a business as tailors, crafting bags and clothing in order to build a new, better life with their families. 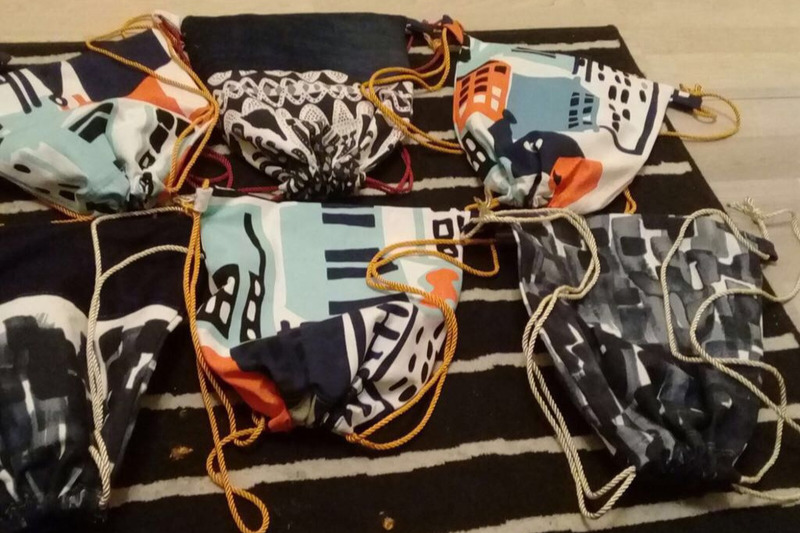 We’d like to help Buba, and want to see more beautiful BubaBags. In order to produce bags, he needs good industrial sewing machines, which are very hard to get even second hand in Gambia. We want to buy and ship four sewing machines to him, pay for the rent and renovating of the house, and give him funds to buy fabrics for the bags. You can donate to this cause and pre-order bags at the same time. Just take a look at the pictures below and our thank-you price list. If you´d like to receive a thank-you gift for your donation, get in touch with us by pressing the message icon up top, next to the organizer´s details and leave us a message saying what bag you would like to order and where you want it to go to. We will get in touch with you as soon as the bags are ready, and we´ll always keep this site here up-to-date, so you can check in on the project. With the money we raise, we will buy and ship the sewing machines to Buba, who will then get to work on your orders. Any money that is left after that, will go directly to Buba, so he can buy materials for his bags, renovate the house and afford the rent. Right now, Buba is desperate to get to work but hasn´t got the resources. Next year, one of the Peacecamp coordinators, AnnPhie, will go and visit Buba, see how he and his friend are doing and collect the bags, that you’ll all be desperately waiting for. The bags will be brought back to Europe and then shipped to you. 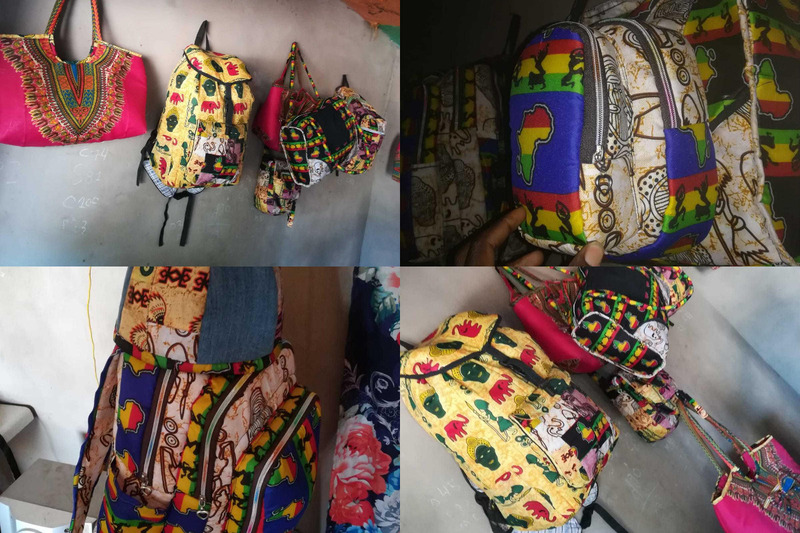 Our hope is that once you lay eyes on your brand new BubaBags, all of your neighbours, friends and siblings will want one too and that we might actually be able to start a little business, so that you can carry everything you own in a hand-made, upcycled Gambian bag that supports a boy, his family and his village. Of course you can also just donate without ordering a bag -any help you can give will be greatly appreciated, please help us by investing in Buba´s future and make BubaBags a brand! Stylin´! 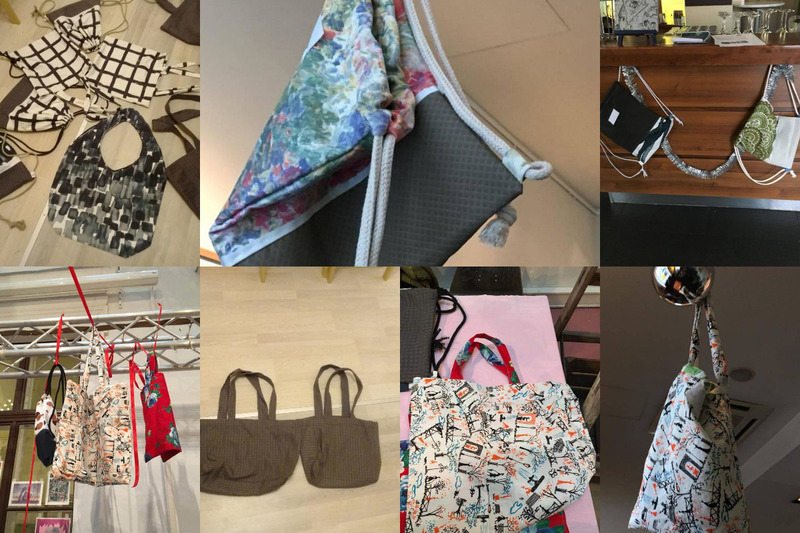 Shoppers, sportsbag and yoga-mat bag. Some more complicated designs by Lamin. Dear supporters of our campaign! Let us start by thanking all of you for your generous donations so far. Our campaign started off really well, these last weeks it slowed down. That doesn´t mean that we have stopped working! On the contrary: A lot of good things have happened and are going to happen and for that we need the funds! So please stick with us, continue to tell your friends about this and share this update! We have not yet reached our goal and Buba is sitting on an empty construction site - but let´s start at the beginning, shall we? In the last Update, we told you about the two sewing machines that we bought in Vienna and that are going to be shipped to Kembujeh. The container will leave Vienna next week. It is set first for Hamburg, Germany, where it will be packed onto a ship and then travel to Gambia. The transport costs 300€. As we will have some space left in the container, we decided to get some other things down to Buba together with the machines. Evelyn Böhmer-Laufer, founder of the Peacecamp, where all of us met for the first time, launched a request for textile donations and got great response! Alltogether seven bags full of old cloths are ready to travel to Gambia and start a new life as beautiful BubaBags! Meanwhile in Kembujeh, Buba hasn´t just been sitting around, waiting. He kept searching for affordable second hand sewing machines (remember –since they are rare and expensive in Western Africa, we had decided to buy them in Europe and ship them) and finally found two! We are happy to anounce that on January 18th, 1000€ from your donations were transfered via World Remit to Buba. 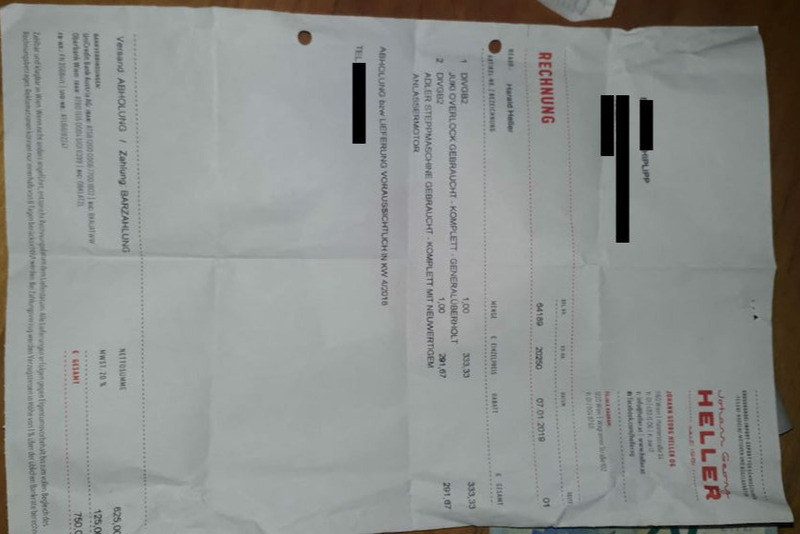 The exchange rate offered by World Remit is slightly better than Western Union: For € 1000 that were sent, Buba received GMD 51,852.81, which is about € 927. He invested this money in the two sewing machines which cost GMD 22 000 (about €400) and spent the rest on electricity, which has to be bought separately in Gambia and is quite expensive. He also finished the repair works for the roof of his house. What he needs now, is a place to set up the sewing machines, plug them in, with enough space for the other two coming. In other words: He needs a place where he can get to work. Buba wants to build his own shop, where he and his friend will be sewing and selling. 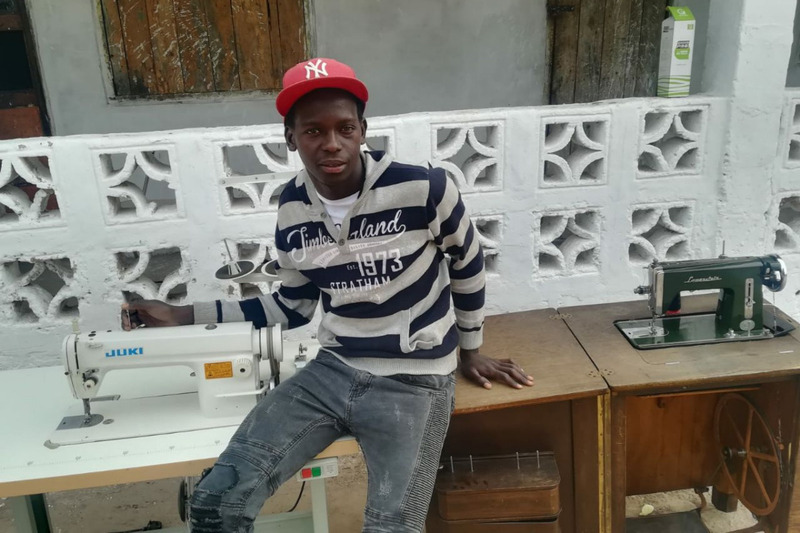 He is very eager on finishing the constructions within a month, so that when the container from Europe arrives, he can set up the machines and finally start his new life as a tailor in Gambia. So at this very moment, Buba is standing at his empty construction site, literally empty handed. He needs roughly €500 to complete the building, buy the material, pay workers etc. After paying the container for shipping the other two machines, we are still slightly short of money to make sure that €500 reach Buba with the current exchange rate. In order to reach our initial goal of €3500, we still need to raise € 857. With this money we could finance the building of Buba´s shop and hopefully give him a few funds to set up shop and start working on your BubaBags. So please share this update, tell your friends about our project, show them the pictures. 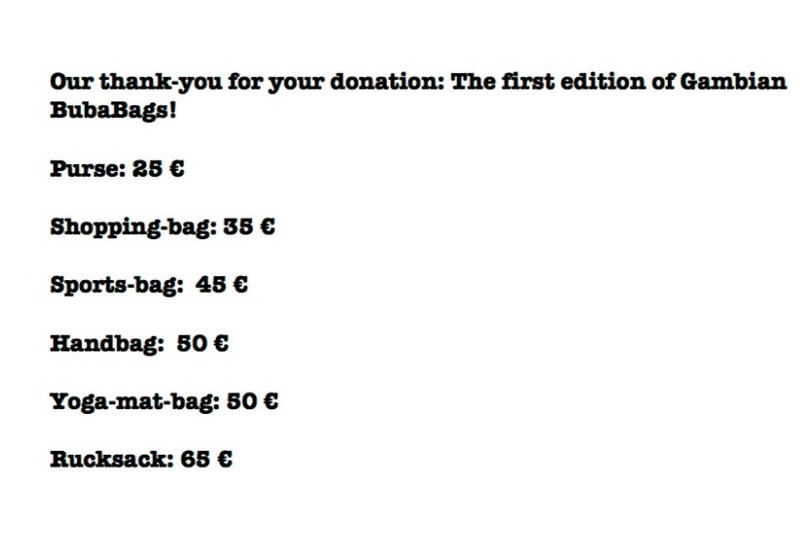 Remember: For every donation 25€ and above, you will receive a BubaBag. To place your order/ tell us where you would like yours to be shipped, or if you have any further questions about our project, just click the button "contact the organiser" and drop us a note. We´re looking forward to reading from you! 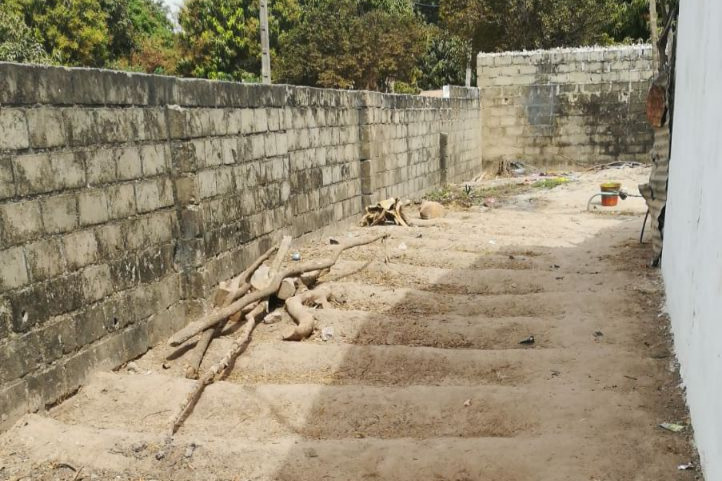 Below you can see Buba in front of his house with his two new sewing machines purchased in Gambia and the empty spot, where he will build his own shop, as soon as we secure the funding with your help. Hello Everyone, we are writing a new Update, because we have got NEWS! With your generous help, we have been able to buy the first two sewing machines from the Viennese business J.G Heller ( www.heller.at). After hearing Buba´s story and learning about this campaign, the owner suggested two of his second hand modells: The ADLER is perfect for the long transport and use in a foreign country, as it is made from one piece, very robust and needs virtually no spare repair parts. It is easy to maintain and repair and can saw thicker fabrics as well as thin leather. Mr. Heller will build in a completely new motor. The JUKI OVERLOOK is a professional machine for sewing up seams. It will also be completely refurbished. They both work with normal electricity, luckily the same voltage runs in Austria and African Countries, all that is needed are adaptors to plug them in. Mr. Heller also offered to wrap and box both of the machines in order for them to make the journey unharmed. He will keep them safe until we have organised the other two machines and deliver them to the transport free of charge. 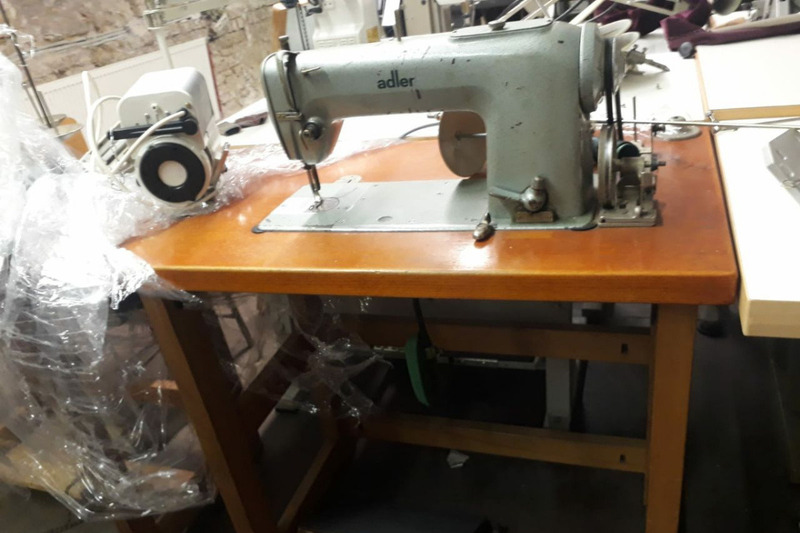 The two machines, including spare parts, needles, repairs and boxing come for a discount price of 750€, as Mr. Heller wanted to support the young Gambian tailor. We want to send a humongous THANK YOU to Mr. Heller for his professional advice and help. 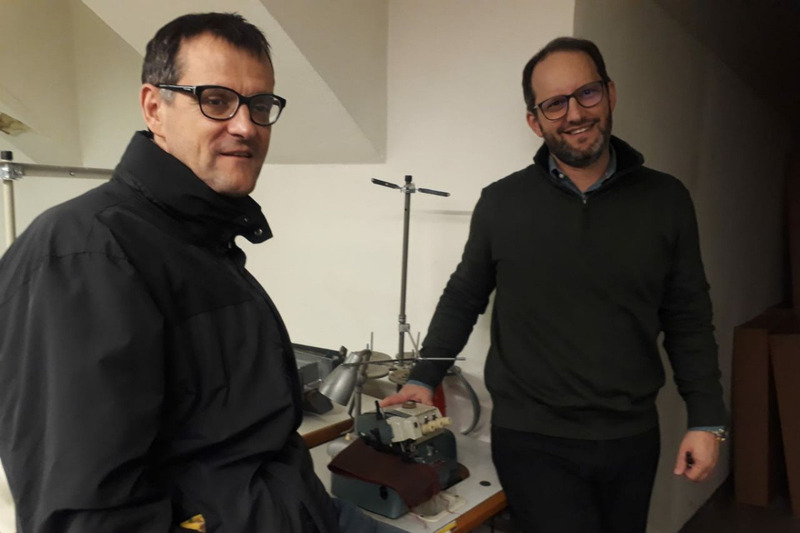 Also, a shout out to Philipp from the Austrian organisation Caritas, who has been Buba´s councelor for the last years and whose zealous efforts allowed us to find industrial sewing machines that will allow Buba to work independently, while fitting in our budget. 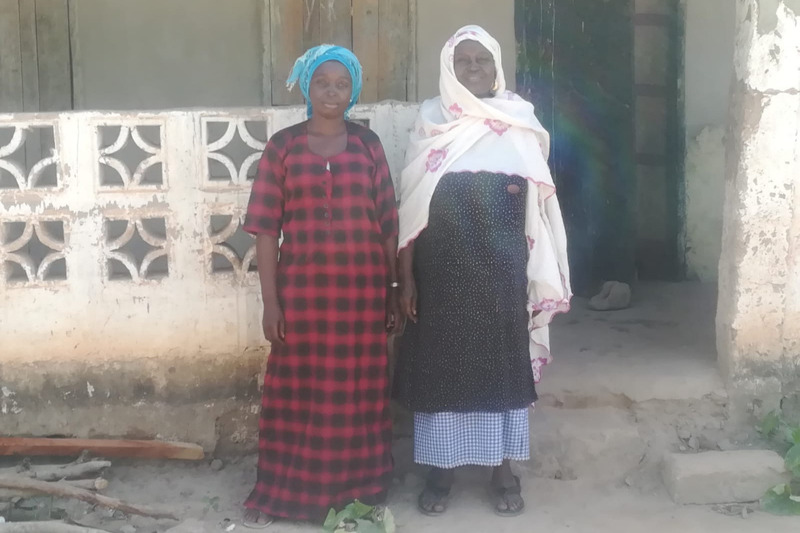 Speaking of budget: We still have to buy two more machines and pay for the transport to Kembujeh, Gambia, as well as raise funds for fabrics and material before Buba can get to work. So please, continue sharing this campaign, tell people about it and do not forget to order your own BubaBags, starting from a donation of 25€: BubaBags for everyone! And now, without further ado: Look at these beauties! The ADLER and the JUKI OVERLOOK with Philipp and Mr. Heller. Also, the account for the two machines, because we are comitted to complete transparency with your generously provided funds. 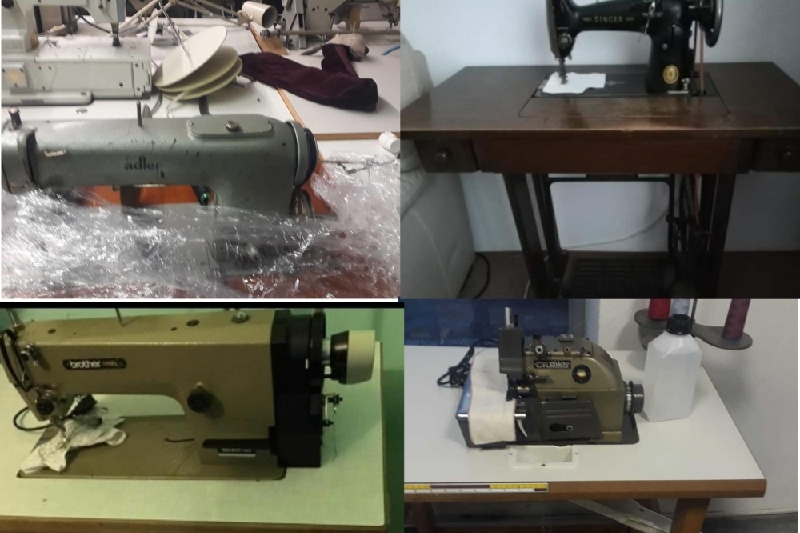 These are the sewing machines that we will buy- three of them work with electricity, one is mechanic. They are currently being repaired and we will hopefully be able to pick them up at the end of january. At this point, we want to say a big THANK YOU to all of those, who have supported our campaign so far - together you are financing these machines for Buba and already have raised some funds for shipping them!!! This will be our next big step and not an easy one: to make sure the machines reach Buba in Kembujeh, Gambia. 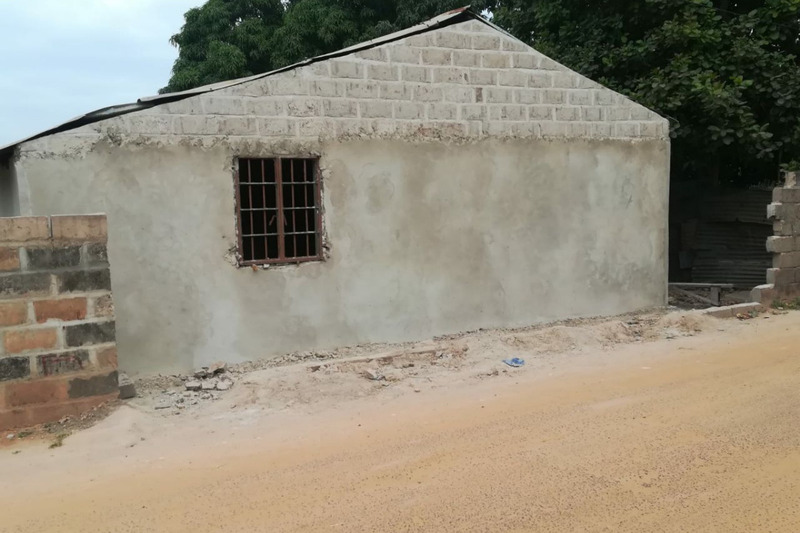 For that purpose and in order to also give him some funds for fabrics and support him with the renovation of the house, we still need to raise some more. So please, any small amount of money you can give is helping and every person you're telling about this is too! To all of you celebrating christmas, we wish happy holidays! And don't forget to tell us, what bags you would like to receive for your donations! Your #Bubabags will be made on these! 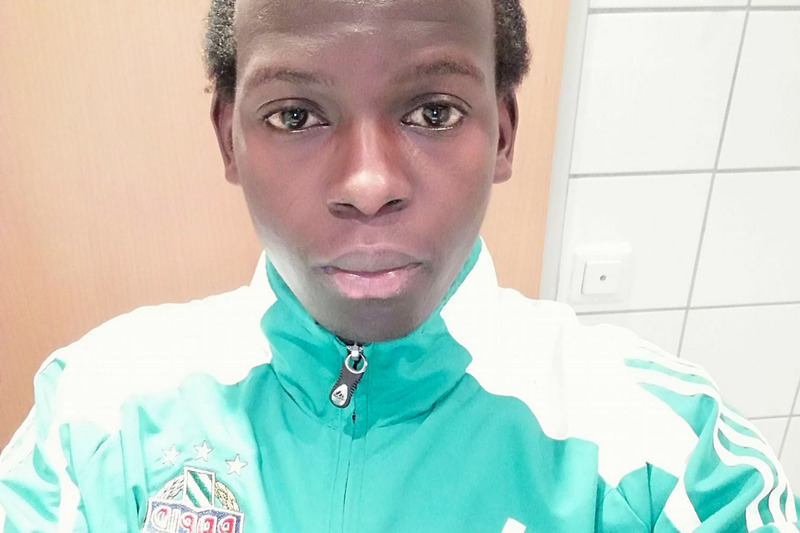 Buba 19 éves és Gambiából jött. Gambia egy kis ország Nyugat Afrikában. Két öccse és egy húga van. Édesapja meghalt még Buba gyermekkorában. Buba szabónak tanult és részt vett az iskolai színjátszó csoportban, de a nagy szegénység miatt arra kényszerült, hogy elhagyja Gambiát 15 évesen. Röviddel ezután az édesanyja és a testvérei Szenegálba költöztek. Buba 1 évet töltött Líbiában, majd Bécsbe érkezett 16 és fél évesen. Kísérő nélküli kiskorúként egy fiatalokkal foglalkozó központba került, ahol németet és alapfokú oktatást kapott, miközben menedékkérelmet nyújtott be Ausztriába. Bubával 2017-ben a Peacecamp-ben találkoztunk. A Peacecamp minden évben júliusban kerül megrendezésre egy nyugodt városkában az osztrák Alpokban, ahol konfliktusos környezetből érkező fiatalok találkozhatnak egymással. Zsidók és palesztínok Izraelből, osztrákok és magyarok, és persze menekültek. Ez egy rendkívüli lehetőség és tapasztalat volt minden résztvevő számára. A nézetkülönbségek ellenére megtanultuk megérteni a másikat beszélgetések és színjátszás által. A szabadidős tevékenységek során pedig egy igazi nagy családdá váltunk. Buba ennek a családnak a tagja. Jóindulatú, odaadó, humoros tagja. Ezen kívül Buba lelkes futó, focista és remek színész is. Mikor meglátta, hogy a táborvezetők milyen színes nadrágokat viselnek, azt mondta a tábort alapító Evelynnek, hogy ezeket ő is el tudná készíteni. Evelyn szerzett egy használt varrógépet és a Peacecamp-et követő évben Buba adományanyagokból gyönyörű táskákat készített. Ezek a táskák egytől egyig újrafelhasznált anyagokból – úgy, mint régi nadrágok vagy függönyök – készültek. Buba táskáit kisebb adománygyűjtő eseményeken és a karácsonyi vásárokon is meg lehetett vásárolni. Sok felkapott, divatos táskával ellentétben ezek erős táskák, melyek sokáig tartanak, mivel nagy körültekintéssel lettek kiszabva és kézzel készültek. Jók bevásárolni, vagy akár sportoláshoz is. Mikor Buba betöltötte a 18-ik életévét, már nem volt többé kiskorú, és az osztrák kormány nem gondolja a szegénységet alapos indoknak a menekültstátuszra. Egyik kérvény és levél sem talált meghallgatásra, és Buba az édesanyjának sem merte megmondani, hogy ki fogják toloncolni. Rettenetesen félt, de mi megpróbáltunk reményt adni neki. Bár úgy érezte, nem sikerült egy új életet felépítenie Európában, és most üres kézzel távozásra kényszerül, éreztettük vele, hogy vannak barátai Ausztriában, Magyarországon és Izraelben is. Buba most egy apró faluban, Kembujeh-ben él az édesanyjával, aki visszatért Szenegálból, hogy vele lakjon. Azt szeretnék, ha Buba testvérei is visszatérhetnének, hogy együtt élhessenek, de a házuk túl kicsi és a tető is beázik. Szeretnék felújítani a házat, de a bérleti díj kifizetése is nehézkes, ami körülbelül 200 euró (67.000 forint) havonta. Sok munka vár még rájuk, és Buba magára akarja vállalni az egész család támogatását – akik jelenleg is Szenegálban vannak még. Buba szeretne egy barátjával varrodát nyitni, hogy táskákat, ruhákat készítsenek, hogy új, jobb életet biztosíthassanak a családjuknak. Szeretnénk segíteni Bubának, és persze szeretnénk még több általa készített táskát. Hogy elkezdhessék a munkát, szükség lenne jó állapotú ipari varrógépekre, a ház felújítására és anyagi forrásra, hogy alapanyagot vásárolhasson. Adakozhatsz a cél érdekében és egyben előrendelhetsz táskákat. Csak tekintsd meg a fenti képeket és az árlistát. Ha te is szeretnél rendelni, csak küldj egy emailt címre a neveddel, hogy milyen táskát szeretnél, és hogy hova szeretnéd, ha postáznánk. Amint készen vannak a táskák, felvesszük veled a kapcsolatot. Rendszeresen adunk majd tájékoztatást a projektről is, amit figyelemmel kísérhetsz. Ha sikerül megvalósítani a céljainkat, megvesszük a varrógépeket, eljuttatjuk Bubához, hogy azonnal elkezdhessen dolgozni a megrendeléseken. Jövőre a Peacecamp egy ik koordinátora, AnnPhie, elutazik Gambiába meglátogatni Bubát, hogy lássa, hogy mennek a dolgok és, hogy elhozza a táskákat, melyeket már nagyon vártok. A megrendelt táskákat AnnPhie hozza Európába, és itt postázzuk számotokra. Reményeink szerint, amint meglátják az ismerőseid, szomszédaid a Bubatáskákat, ők is akarnak majd egyet, hogy egy igazi, kézzel készült, menő, újrahasznosított táskájuk legyen, amellyel egy fiatalembert, a családját és faluját is támogathatják. Nyilatkozat: Mindenki, aki részt vesz a BubaBag projektben, önkéntes. Semmi profitot nem tartunk meg, minden bevétel és felajánlás a BubaBag projektnek megy.